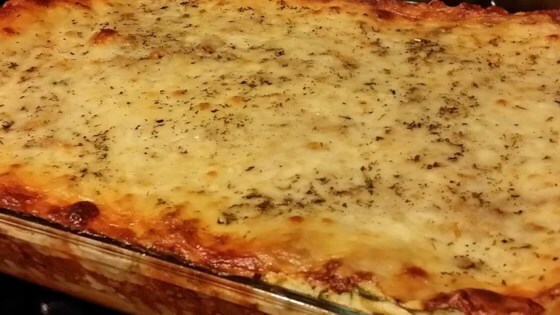 "A delicious version of lasagna for those of us who are health conscious." Heat the olive oil in a skillet over medium heat. Stir in the onion; cook and stir until the onion has softened and turned translucent, about 2 minutes. Add ground turkey and cook 5 to 7 minutes more, stirring to break up any large chunks of meat. Stir in tomato sauce, mushrooms, Italian seasoning, black pepper, and garlic powder. Simmer for 2 minutes and season to taste. Combine spinach, ricotta, and nutmeg in a large bowl. To assemble, arrange 3 noodles lengthwise in the bottom of a greased 9x13 inch baking dish. Spread with 1/3 the ricotta mixture, 1/3 of the turkey mixture, and 1/3 of the mozzarella. Repeat layers, ending with remaining mozzarella. Bake in preheated oven for 25 minutes. Cool for 5 minutes before serving. I kick this up with 1 tablespoon of crushed red pepper. For my personal tastes I like to kick this up with the addition of a couple of cloves diced garlic, some extra oregano, and a BIG dose of Crushed Red Pepper in the sauce. Yummy Yummy! I made this with vodka sauce & no Spinach! Very flavorful and got lots of compliments! Will keep this recipie! 2 thumbs up! I did increase ricotta mixture and meat mixture by another cup each as i ran out for the top layer..